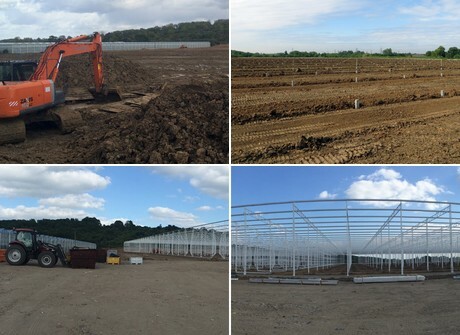 The new greenhouse will be divided into four departments, including the service area. On top of it, tempered glass (1.67m) with a light transmission of 91+ will be placed. The framework has already been installed and it shows something special about the greenhouse: The growers chose to implement the Twinlight construction. This construction, an innovation of Bom Group, realises a more consistent cultivation climate. As the greenhouse column consists of two narrow, thin uprights rather than a large solid tube, more light is let through to the crop. Bom Group is also taking care of the heating and screening system, including the ABS system and a Multirol side screening system on the outside walls. The new boiler room will contain a low-NOx boiler, which will be connected to a new heat storage tank (capacity: 4 million liters). Thanks to that, the nursery will take care of its own CO2-production.